You already know that social media is important. And, Engage was written to for you. It's written to not only learn how to apply social media strategies within your company, it also helps you rally support and implement programs in order to excel personally and professionally. 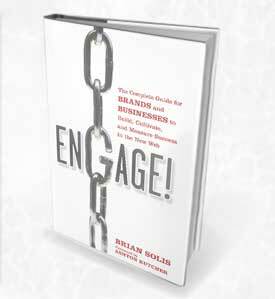 Written by Social Media pioneer Brian Solis with the foreword contributed by Ashton Kutcher, Engage will help you effectively...engage. This book promises to provide the answers and insights necessary to effectively build communities, activate the social web, end the battle of who owns social media, guide you through branding yourself and your company online, and also determine the ROI of everything you do. "Brian Solis is globally recognized as one of most prominent thought leaders in new media. A digital analyst, sociologist, and futurist, Solis has influenced the effects of emerging media on the convergence of marketing, communications, and publishing. He is principal of FutureWorks, an award-winning New Media agency in Silicon Valley, and has led interactive and social programs for Fortune 500 companies, notable celebrities, and Web 2.0 startups. BrianSolis.com is ranked among the top of world's leading business and marketing online resources."